In 1940s South Baltimore there seemed to be a “mom and pop” grocery store on every other street corner—and many more in the middle of blocks—and the densely packed and populated neighborhood of shoulder to shoulder row homes meant their were plenty of people to keep them busy. (One friend of mine, a successful comic strip artist, grew up in a 1,500 square foot home with his parents and six siblings.) Those small commercial establishments were what today we’d call “convenience stores,” the “7-Elevens” of that era. (Among scores of items, they sold my favorite snack food, called “Coddies,” or codfish cakes, made daily and served on salty crackers with mustard; they cost five cents each.) The basic day-to-day supplies people needed were just steps away from their front doors, and everything else could be found at the end of a slightly longer walk to the full-service shopping areas on Light and Charles Streets, and in Cross Street Market; or a short street car ride uptown. Meanwhile, most of the booming wartime labor force walked to their jobs at the dry docks and factories lining the harbor. Few families could afford a car, and none that I knew of had more than one, so there were no parking problems. (That’s unlike today in South Baltimore where there are at least two cars to each home.) 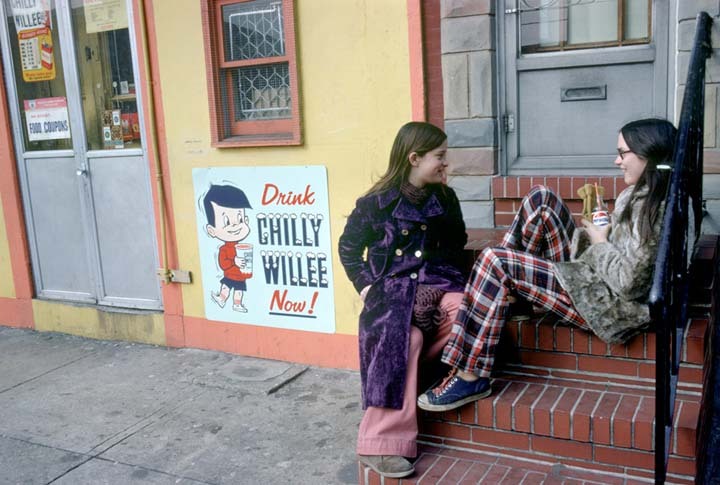 The photographs I’ve used to illustrate this post were taken in the late 1970s, but they give you some idea of what I saw as a boy growing up in South Baltimore in the 1940s and ’50s. 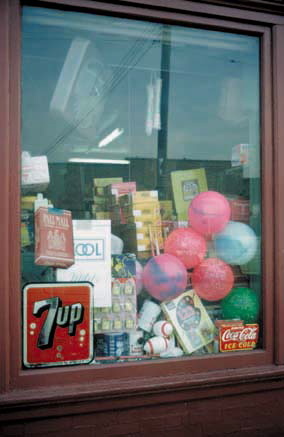 My only regret is that I could have (should have) photographed more of the remaining corner stores—of which there were still many in the ’70s—and the unintentional beauty of their cluttered window displays. This entry was posted on Wednesday, November 12th, 2008 at 3:54 pm and is filed under non-fiction, photography. You can follow any responses to this entry through the RSS 2.0 feed. You can leave a response, or trackback from your own site. We were lucky we lived in those times. Only one who was there can understand what it felt like to walk into one of those places on a Saturday morning in 1956.